A person who does very good things in his life and makes day-to-day things easier for others might be considered an angel. Fayaz Amar Buriro is such an angelic man and well known language engineer. People should be known by skills not with the degrees. Nowadays, many people get degrees but these degrees are not of any worth if they don’t deliver to their people. We can see many examples in our country. There are numerous doctors who do not know which medicine should be used for fever but they have degrees so societycall them doctors and appreciate them as well. However, on the other hand there are various folk Hakeems who have not degrees but they can understand our ailments and can guide us better than those who are degree holders said Amar Fayaz in his talk while he was guest speaker in Hyderabad Literature Festival. Amar Fayaz, a social candidate, was born in a lower middle class family on 1st December 1967 in a small village names Jani Buriro, District Khairpur Mir’s. His father Hamiz Ali Buriro was a tube well operator and honorary post master with a kind hearted and loving man of The area. Mr. Hamiz Ali was font of reading literature especially the poetry of classic poets like Shah Abdul Latif Bhittai and always loved his land, culture and language. He had four sons and four daughters. He groomed to his children with wide range of literature. In the patronage of father Fayaz Amar learned to service. 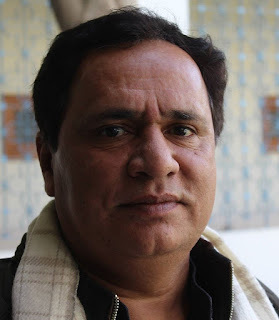 Today Fayaz Amar is a philosopher, story writer and well-connected with google. He got his early education from his own village. Amar did his matriculation from Government Naz High School, Khairpur. And Diploma in Mechanical Engineering from Govt.Technical College Khairpur in 1987. He got Masters degree in Sociology from Shah Abdul Latif University in 1999 as private cadidate. He was appointed as Sub Engineer in Pakistan Railway in 1990 and resigned in 1999. “I think the environment of the department was not matching my nature and at least I didn’t want to be a robot, so I resigned.” Amar Explained about his resignation. He joined in UNO and served as communication officer and then he found in himself that there is a language engineer in his inside and he focused his activities in computational programming. In 2012 he developed first light weight Urdu Nastaliq font named “Amar Nastaliq” and it was well recognized and Amar was offered IT consultant in Geo TV network. Beside that Amar Fayaz was also offered a post “Head of Department” in Information Technology in Newsports Institution of Communication and Economics Corporate, University of Karachi. Then Government of Sindh reached to him and brought him in Sindhi Language Authority as IT Specialist. In SLA he developed Sindhi Portals online and got appreciations from all walks of literary persons. Beside his successes Amar’s personal life is much harder than anyone can think. From 2000, he has been fighting with cancer and had five tumors in brain. he was gone through a surgery. One tumor is still in his brain. His friend, Wafa Qambrani says that Amar likes to stay quiet. He does not interfere in anyone’s personal matters. While his other friend, Atif Vighio commented that Fayaz is very much sincere with his work. Ghulam Rasool Chachar says he do not make much friends as he doesn’t like a bulk of people and love to stay solitude. Amar has also compiled the best seller English to English dictionary which was published by Oriental Book Society Lahore. The dictionary had made record selling in the market. Amar Fayaz had written hundred articles in Sindhi language which were published in Daily Jago, Kawish and other local newspapers. Amar's Urdu Article blogs were published on website where majority of his blogs became the most controversially because of the nature of Amar's as hammer on the rock today he is webmaster of more than 50 multilingual websites. He said I have endeavored to bring latest technology to the service of major Pakistani languages such as Urdu and Sindhi. He further says that: “I realized that these languages face formidable challenges due to non-compability with browsers designed especially for the handheld device such as Cell phone.” He is silent lover, silent doesn't mean that person quiets it simple means that He doesn't want to argue with people who just don't want to understand. No doubt that quiet people have the loudest mind.